Yadira Baltier-Moreno is really planning ahead. Baltier-Moreno wants to transfer to a four-year school to earn her bachelor’s degree in philosophy or business before going on to law school. Once she has her law degree in hand, she envisions starting a firm staffed with lawyers of color, representing low-income families and helping non-profits work with at-risk youth. 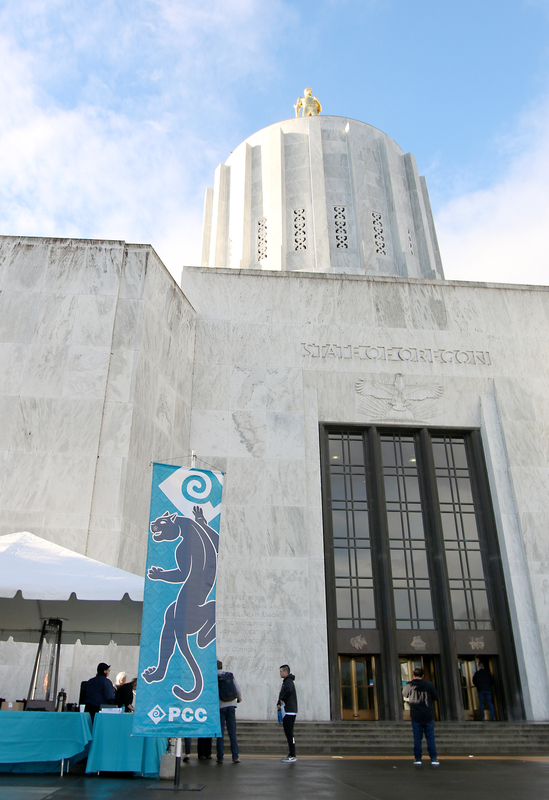 While she juggles her education at PCC with an internship, she is learning about the legislative process first-hand as one of 11 PCC students currently interning at the Oregon State Capitol. She works in State Representative Tawna Sanchez’s office, who represents North and Northeast Portland. Rep. Sanchez’s district includes the Cascade Campus, where Baltier-Moreno takes most of her classes. PCC is seeking to increase the kind of wrap-around support that has helped Baltier-Moreno be successful. Oregon’s 17 community colleges are asking the Oregon Legislature for a budget of $787 million for the 2019-21 biennium. Within that funding is $70 million to expand completion programs to serve 11,880 additional students at PCC. As a legislative intern, Baltier-Moreno helps facilitate constituent meetings, and answers emails, letters and walk-in inquiries, as well as attends committee hearings and watches voting on the House floor. 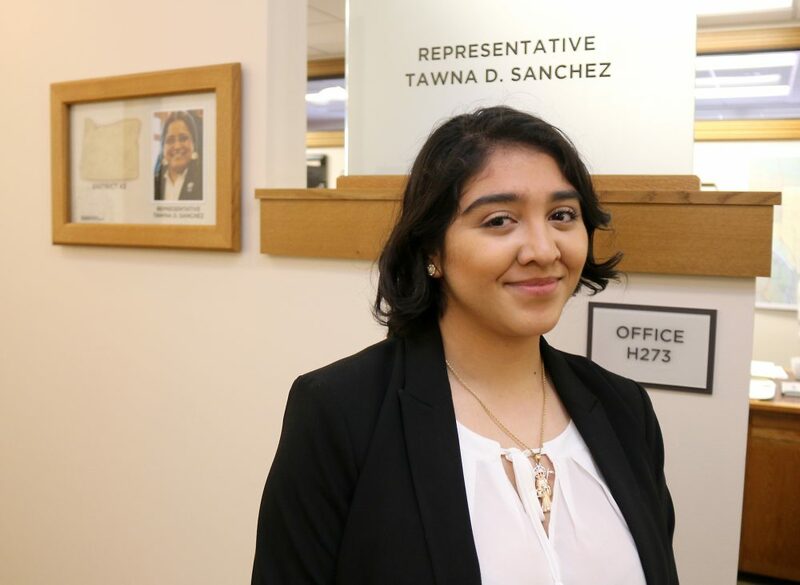 Baltier-Moreno is interning at the Capitol Building in addition to her role as a leader in student government at PCC. She’s also a student in Future Connect, a scholarship and support program for students who identify as first-generation or are low-income. She has been thriving at PCC with the ongoing support from her college success coach Josh Mead. She grew up in North Portland’s Portsmouth neighborhood and is the oldest of three siblings. One of her favorite parts of her education here at PCC is the ability to take classes she’s really interested in, like “cool social science courses like Chicano Studies, or Women’s Studies.” She also volunteers her time at Causa, an immigrant rights organization, and the League of United Latin American Citizens. As an Oregon Promise student, she values her access to higher education and is dedicated to her studies, earning an impressive 3.92 grade-point average. She has kept her grades up even through some pretty challenging health issues. She had an active role with the Alternative Break Program that included lobbying legislators in Washington D.C. She provided insight about the Second Chance Act Grant, speaking on behalf of inmates reentering society from correctional facilities. She wants to expand opportunities for them to have a chance to go back to school. And her planning ahead is paying off. She was just accepted into Pacific University in Forest Grove and was awarded a scholarship. In addition to Baltier-Moreno, 2018-19 PCC legislative Interns are: Amada Rabauliman (State Senator Mark Hass); Andrea Rubio Ramirez (Rep. Alyssa Keny-Guyer; Areebah Zaidi (Sen. Rob Wagner); Joshua Baker (Rep. Rob Nosse); Marina Tatsuoka (Rep. Tina Kotek); Matthew Hampton (Sen. Michael Dembrow); Mia Bolte (Sen. Floyd Prozanski); Tennille Ann Wait (Sen. Mark Hass); Vee Vo (Rep. Diego Hernandez); and Whitney Whitehouse (Sen. James Manning). The application for next year’s Intern cohort opens on first day of fall term 2019 (Sept. 23). For questions, contact Stephen Arthur, Sylvania’s Student Life and Leadership Development manager, at stephen.arthur@pcc.edu or call (971) 722-4920.